This October marks my tenth year as a runner. The me from 15 or 20 years ago would have found that absurd. I was never an athletic kid. I lazily played softball into high school, shifting my weight from side-to-side in the outfield, waiting for a fly ball. I briefly joined the high-school track team — I struggle to recall why — but I lasted all of about four weeks until I got a part-time job at The Corner Pharmacy making milkshakes. So although it took a while, I’m thankful every day to have found something that makes me so happy, that’s changed my life in a way nothing else has. Although I’ve now had many sporty influencers in my life — some of whom I never even knew by name — but it all started with Lee Purdy, a co-worker from my days at Carelli Costumes. We were working 60-hour weeks, and somehow Lee found time to train for a marathon. Lee looked like a classic runner — trim and lean, athletic. We didn’t resemble each other at all. Yet I was curious about her running, and the races she was doing, and the camaraderie she was finding with other runners. She was very encouraging, offering to join me if I signed up for a race. So I started jogging a little bit in Astoria park, adding a little more each week. And I took Lee up on her offer. In Oct. 2002, I competed my first 5-mile race, with Lee Purdy running alongside the whole way (no doubt a good bit slower than she was used to running). But something weird happened after moving to Brooklyn. Maybe it was having a new park to explore, but I started running again in a big way, my times improved remarkably, and I discovered a ferocious competitive streak. And though I really love races, I also enjoy encouraging people to try running, even if they don’t think they “look” like a runner. I always enjoy a nice jog with a newbie. During my time at About.com, led some after-work happy hour runs, something I hope to do again. 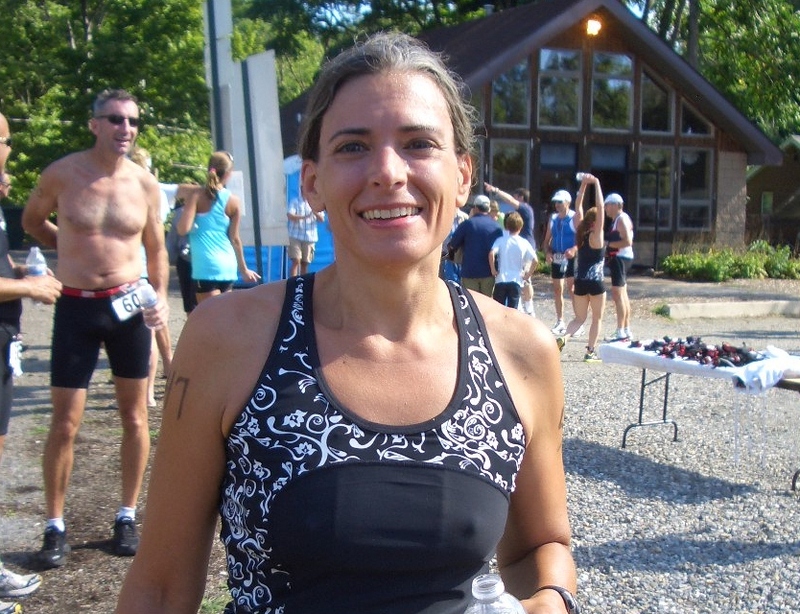 Me this month after the American Memorial Triathlon in Greenwood Lake, NY, where I place 8th among women. There’s no conclusion to this post — just a big arrow pointing ahead to what I hope is a long-distant finish line. And if anybody wants to go for a run, or even a little run/walk, I’m your girl. I have certainly learned one thing: You can do a LOT more than you think you can. Your mind is the main thing in your way. So find a way to get past your perceived limitations. I’ll be running Sunday morning, so call me if you want to meet in Prospect Park, okay? This entry was posted in Running and tagged Brooklyn, marathon, triathlons. Bookmark the permalink.